That thirst is your body calling for re-hydration! Proper hydration is critical to everyone. Water helps to regulate body temperature, keeps joints lubricated and helps the body to move nutrients freely. When you aren’t properly hydrated, your athletic performance suffers. Muscles will cramp because of dehydration. You may even experience dizziness and fatigue. There are no set guidelines for keeping your body hydrated. Often, the fail safe eight cups of water per day isn’t enough. This is especially the case for athletes that need to increase their fluid intake. 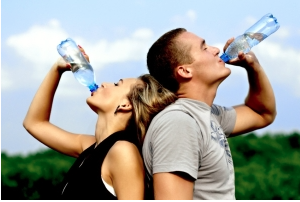 The American Council on Fitness recommends the following to help you achieve proper hydration. 3 hours before you plan on running or exercising, drink 20 ounces of water. 30 minutes prior to exercise consume an additional 8 ounces of water. Every 10 minutes during exercise consume 7 to 10 ounces of water. Finally, drink an additional 8 ounces of water within the 30 minutes following exercise. When dehydrated it is often a good idea to keep sports drinks to a minimum. While they are high in potassium and offer electrolytes and energy, they are often high in sugar. This can make them counterproductive to your weight loss efforts. Just like proper hydration is important for athletic performance, it is equally important for your massage and bodywork. Before you have a massage, make certain you are drinking plenty of water. You should continue to drink plenty of fluids after your massage session is done. Being hydrated before your massage will help you have pliable tissue. This will allow for a more effective massage. Not only will it help remove toxins like lactic acid, but it will also help to give you a more relaxed feeling. Proper hydration is important to reduce post massage pain. Dehydration often leads to the flu like symptoms some feel after a deep tissue massage. Consuming enough water also allows the circulatory system to work. This helps the lymphatic system to ward off infection and to expel additional toxins post massage. Chronic pains such as back pain, neck pain, and hip pain can be caused by dehydration because the muscle, tendons, and ligament tend to become tight. This causes lack of flexibility and joint stiffness. As you can see, drinking water is important. Not only will it help with your athletic performance, it will also provide you additional benefits when you are enjoying your massage. Make it a point to drink plenty of water during your exercise routine, along with at least 8 additional servings of water daily.